Last year, my wife and I welcomed our first son into the world. As first time parents, we tried our best to prepare for every possible expense we would encounter. Like most first time parents, we failed miserably. Before our son came along, I drove a Japanese sedan and my wife drove a Japanese hatchback. Both cars provided us plenty of space and we figured adding a child to them wouldn’t be a problem. In fact, one of the main reasons I bought a sedan seven years ago was because I figured down the road I’d want a four door car when I started growing my family. We quickly learned a small sedan and a small hatchback weren’t the perfect vehicles for a family of three. The child car seat required the front seat to be further forward than is comfortable for most people. We decided we could live with the discomfort for a short while until our son graduated to the next car seat. A few months after our son was born, we packed up our car and headed out for a 12 hour road trip to visit the in-laws. After we loaded the car, we realized we had zero space left in the vehicle. If we wanted to bring our dog or had to bring anything else with us, it simply would not have fit. That trip was very uncomfortable for everyone in the car. We quickly realized that making multiple 12 hour road trips in our current vehicles would not be pleasant. So, we started looking at alternatives. It’s important to note that buying a bigger vehicle was not a need. Our current vehicles drove just fine and we could get by without buying a larger vehicle. We could learn to pack lighter, rent a bigger car for our road trips or simply fly in the future. Thankfully, we had been saving money for our next car purchase, even though we had no idea when it would be. After much thought, we decided that buying a bigger car was a want that was worthwhile to us, even though it could end up being pretty expensive. We thoroughly investigated our options. Cars seemed a bit too small, but SUVs seemed to be a waste. They were uncomfortably high off the ground to lift a car seat into and didn’t have as much space as you would think unless you were prepared to shell out an insane sum of money. We also don’t know if more children are in our future, so we wanted enough space for at least one more child and a pet to make any future road trips. All of that research led us to an obvious, but not popular, choice. The minivan. Personally, we don’t care what other people think. 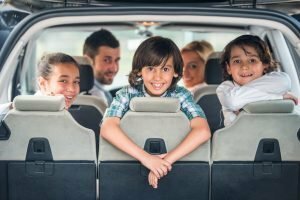 Once we discovered minivans, we couldn’t figure out why more families don’t drive them. After months of research and looking at cars, we decided we wanted to purchase a 2018 Honda Odyssey minivan. We had enough to pay for the vehicle in cash if that was what we decided to do. Once we picked out the car, trim and color we wanted, I started shopping for a vehicle. Most people simply go down to their local dealership and negotiate for the car they want. These people could be making a great decision or an awful one. If your local dealership is a no nonsense, high volume dealership, you could get a great price. If they’re like my local dealership and like to make money from accessories and haggling for every penny, you could be paying as much as a few thousand dollars more than you should. A few people take things a step further and go through a car buying service or visit a few dealerships in the area rather than just one. Visiting a handful of dealership may provide a better deal, but if they’re all shady, old school car dealerships you still may end up with a bad deal. Using a car buying service, such as those through USAA, Costco or Edmunds, can usually get you a decent deal. Of course, those car buying services are making money by sending the dealerships new customers. That means you’re not getting the best price possible. I took things to a different level. I searched a huge area for the specific car I wanted then emailed all of those dealerships. The car had just come out two months earlier, so I wasn’t even sure I’d get a good deal because inventory was low. Luckily, I searched for and found a forum that showed the prices other buyers were getting to see if the dealerships I was emailing were giving me a good deal or not. Ultimately, I got an amazing quote from across the country and a bunch of mediocre quotes locally. I was about to make the trip across the country to Chicago when my wife and I decided to visit a dealership two hours away that had our exact car in stock. We wanted to see the exact vehicle trim and color combination before making the cross country trip. The dealership knew I had an amazing quote from Chicago and made me a decent offer. It wasn’t good enough. We took a look at the van and knew we wanted what we had originally thought, so we figured we’d give this dealer one more chance. I told the dealer flying to Chicago wasn’t free and neither was driving home. I showed the dealer the total cost of the car and my trip and said if you can do this number, I’ll buy today. They came back $400 above the number I gave them. Before we arrived at the dealership, my wife and I had valued my time flying up and driving back at $750, so $400 over my Chicago final price was great news for us. We decided to buy that day. We could have gotten a better deal by waiting six to twelve months. That said, we probably would have only saved another $500 to $1,000. Getting the car now was worth the cost to us. We almost messed up and didn’t get the car, though. More on that in a minute. First, look for forums that share the exact prices other people paid for the car you want. This will give you an idea if the quotes you receive are in line with what others are paying. Next, search for dealerships that have the car you want. Ask for a quote. After you receive a few quotes, get your best quote and shop it around to all of the other dealers that made you offers. Go through this process until you have one dealer willing to offer you the best price. Make sure all quotes have the final price you’ll have to pay before you walk out the door. Emphasize this to everyone you speak with and let them know if you show up and the final price is different, you’ll walk. 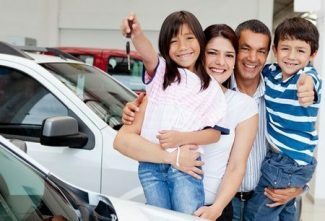 The number one rule of financing a car is always have financing lined up in advance of your purchase. You may end up getting a good deal through dealership financing offers, but that isn’t guaranteed. We broke this rule, but not on purpose. We didn’t think we’d actually end up purchasing a vehicle the day we went to look. Thankfully, I did do some research ahead of time to know if I was getting a good financing deal or not. After applying with the dealer, we were offered 36 month financing at 2.54 percent, which isn’t awful. I knew I could get the same 36 month loan for 1.49 percent at PenFed credit union. So, I pulled up PenFed’s website and applied while I was at the dealership. I figured they could wire the funds and I’d walk out the door with our new car. I was automatically approved for the loan but PenFed had to mail me a check to give to the dealership. PenFed could overnight the check but I wouldn’t have it until the next day. I didn’t know what to do. The dealership was two hours from home and driving four hours in one day with a baby isn’t fun. Do I drive four more hours once I get the check to get our car? Go with the 2.54 percent financing or pay cash and take the car today? None of the options seemed appealing. The car dealership saw I had amazing credit and decided to let us walk out the door with the van that day. All they asked for was a personal check to hold until my loan check came through. Once I had the loan check, I overnighted it to the dealership and they sent back my personal check. I got lucky. The dealership could have played hardball and made me pay cash or take their sub-optimal financing. Fortunately, the dealership knew I had amazing credit and had no reason to back out. After all, I was willing to fly across the country to buy it. They made me sign an agreement to cover themselves should I not send the money and we were on our way. While we could have paid cash, a loan with an interest rate just 0.34 percent above our savings account interest rate was too good to pass up. Be prepared to buy a car when we least expect it if the price is right. I hope you learned from my mistakes and your next car buying process goes a bit smoother than ours did.